Late in 1984 a small group of wood lathe owners met together in a private house and, with two objectives in mind decided to form a guild. Those two objectives were to firstly further the craft of woodturning and secondly to help one another. The first newsletter was published in December of 1984 and contained a list of 40 names. The first official meeting was held at Rangitoto College on Tuesday 26th February, 1985. On September 16th of that year a Special General Meeting was called to consider an application to become an Incorporated Society. This proposal was endorsed and carried out. So, the question of "Who we are?" although answered in part by the above information which states "What we were", more important is "What are we now?" The broadbrush description above still holds true. We are a group of woodturners who meet every Tuesday night of the school year to discuss, practise, learn, encourage, observe and help each other with the craft of Woodturning. Our members cover the normal range of individuals involved in a craft. From professionals who earn their living woodturning, enthusiastic amateurs who turn wood for fun and relaxation, very experienced woodturners who delight in the complexities of a particular project and making their own tools to assist, woodturners who for a variety of reasons have decided to stand back from their lathes but still come to the meetings and still contribute their knowledge through to woodturners who are students in every sense of the word. Our shedule for any particular term includes a 'project', demonstrators, 'practical nights' which cover subjects such as tool sharpening, lathe maintenance, where to buy equipment, etc. etc. Each weekly meeting welcomes any new members and visitors, discusses any general business, upcoming events, advises opportunities for wood recovery, draws the weekly raffle, advises of the subject matter for the night and the next meeting, provides a 'show and tell' format where members show what they have recently made and talk about the problems and/or opportunities which the object provided for them and perhaps seek advice. Partners are invited for the end of term meeting and there is supper and a judging of the project for the term. In 2007 we moved into premises in Glenfield, a 40 year old hall previously used by the boy scouts. 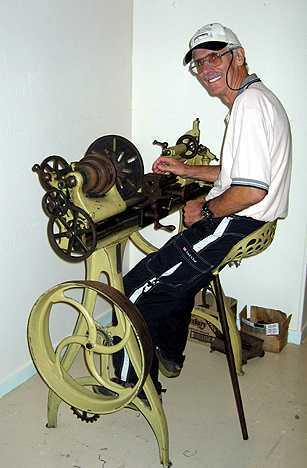 Since then the guild has equipped the hall with a dozen new high quality lathes and other related tools. With the recent transformation of an upstairs area into a library, the complex is now a very good facility for use by all members as well as for the training of groups of youths the guild undertakes. 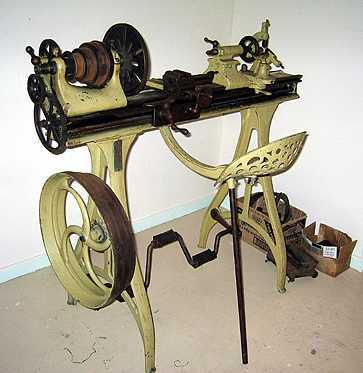 We acquired this treadle lathe in April 2007.